The Transatlantic Trade and Investment Partnership (TTIP) is a comprehensive free trade and investment treaty currently being negotiated – practically in secret – between the European Union (EU) and the United States of America (US). It could have massive implications for people and the environment on both sides of the Atlantic. The stakes couldn’t be higher, and not only for Europeans and Americans, but also for the rest of the world, which would be affected in many different ways by this agreement between these two superpowers of trade. The objectives of TTIP go well beyond intentions to solidify the Anglo-Saxon neoliberal model. It is a geopolitical strategy to confront the emergence of a multipolar world. 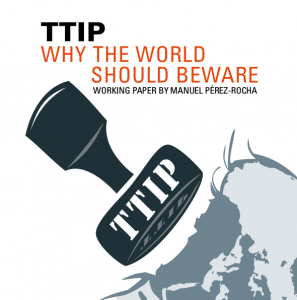 In this paper, we explore from various angles why human rights, environmental, consumer advocate and many other types of organizations all over the world that are working toward a world different from the corporate-led neoliberal dogma, should pay special attention to TTIP.